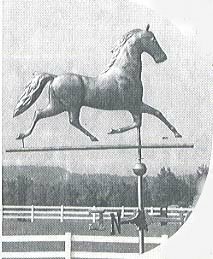 This lovely Trotting Morgan weathervane is being raffled by the National Museum of the Morgan Horse at the 2001 Convention in San Diego. Standing 48� high on its post, the weathervane is 56� high when displayed on its wrought iron stand. Made with a shinny copper finish, it turns freely to face the oncoming winds in any weather. It also looks spectacular inside! Having a replica of an early weathervane in this year�s drawing is quite appropriate. The Museum displays several very special weathervanes which are favorites of visitors. One is a replica of Hale�s Green Mountain 42. It was made circa 1912 in gilded bronze by J.W.Fiske and was cast by Architectural Metals Co. of Patterson , NJ. It is one of about 12 originals made for Henry Wardner, the first president of the Morgan Horse Club, to give to his friends and directors of the Club. The weathervane is on load to the Museum from Helen Davis Stone and family, and was flown for many years over the Windcrest Farm of Mr. & Mrs. F.O. Davis of Windsor, VT.
Another favorite weathervane in the Museum�s collection is a tradition Blackhawk design made by the Harris Company of Boston and given to the Museum by Ron Burrows. The drawing will be held at the AMHA Annual Convention and can be shipped directly to the lucky winner�s home from there. If the winner is present, the weathervane will be on hand so that you may take it home directly if you wish. Convention dates are February 15-17, 2001.